Named as one of California’s best moving companies, Republic Moving and Storage is proud to serve you as an agent for North American Van Lines. 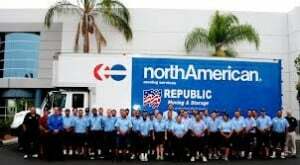 Through a continuing emphasis on service excellence, Republic Moving and Storage has achieved extraordinary growth for over 60 years. Our unparalleled reputation in moving and storage as one of the best moving companies in the industry has been achieved through our steadfast commitment to provide every customer an: economical, safe, professional move by requiring some of the most stringent standards and safety training for our moving and storage professionals. Although Republic Moving and Storage may be headquartered in Southern California, we provide moving and storage solutions to people and businesses all over the world. In addition to our local residential and commercial moves that cover: San Diego County, Orange County, Los Angeles County and San Bernardino County we also offer moving and storage services for long-distance and national moves, international, overseas and military moves. Whether you are moving down the street or clear around the world you can rest assured that Republic Moving and Storage provides the same level of stellar service for every single customer and we will continue this standard of excellence as we progress into the future. Wherever life takes you, Republic Moving and Storage will get you there. To learn more about how we became one of California’s best moving companies or to request a free estimate call us today.